The Giant Snake Mother is the boss of the group event challenge in Bad Man's Hallows. 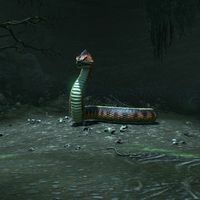 Unlike many of the other group event bosses in Public Dungeons across Tamriel, it is not necessary to complete a puzzle or other prerequisite to fight her. She spawns along with eggs that produce Snake Mother Hatchlings when you get close. Killing her nets you an achievement (see below) and a Skill Point. Bad Man's Group Event 50 Slay the Giant Snake Mother in Bad Man's Hallows. This page was last modified on 25 October 2017, at 11:02.